President’s Summer Fellow Elizabeth Groombridge, ’16 psychology/theater major, is writing and creating a queer, supernatural webseries, “The Green’s Apartment”, based on Shakespeare’s comedy As You Like It. 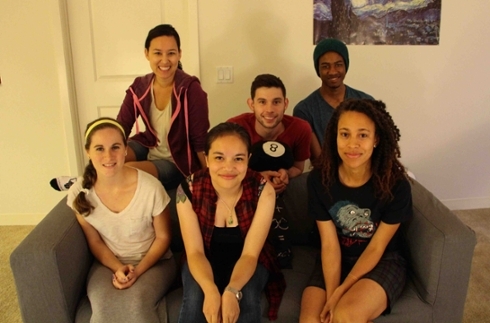 The Green's Apartment is completely written and cast, and filming begins Thursday, June 18. I'm a little behind on my schedule, because casting took longer than expected, but I've got all the shooting scheduled out so it should be smooth sailing from here. I'm really excited about the cast I've got, they're all incredible people and I'm really looking forward to working with them. We had the table read off the scripts this past Monday, June 15, and it all went really well. I'm a little concerned about the actual filming, but I'm making up a shot list so it should go pretty smoothly. All in all, I'm very pleased with where things are at the moment, and I'm really excited to shoot the first episode! The photo is a cast photo taken at the table read. From left to right, top row: Karissa J Murrel Myers (playing Celia), John Magana (playing Silas), and Terry Bell (playing Orlando.) Bottom row: Anna Morreale (playing Phoebe), Perry Nelson (playing Touchstone), and Brooklyn Sabino-Smith (playing Rosalind).